A couple of years ago, I was talking about the use of emojis with a friend when I let slip that I didn’t use them. With words, of course. But in the intervening year, even though I still prefer to use old fashioned verbs, nouns and adjectives to show how I am feeling, my use of emojis has increased. That’s right, the “face with tears of joy” emoji was named the most important piece of language that “best reflected the ethos, mood, and preoccupations of 2015”. Dictionaries, couldn’t have cared less. And their decision is backed by the statistics too. 2015 was the year that emoji use exploded into the mainstream. Across the world, six billion emojis are sent every single day. At current usage that is two trillion one hundred ninety billion every year, and Instagram believes that on current trends they could be looking at a future where the majority of messages will include an emoji in them. And their usage is likely to only become more prevalent if the most recent emoji release by Kim Kardashian is anything to go by. The reality star released Kimojis and broke the record for downloads on the App Store. With 9,000 downloads every second, it was raking in on average $1 million every minute. The rise in emoji use has also been picked up on by social media companies, not only as apps for their users, but also as a metric by which to measure engagement with posts. 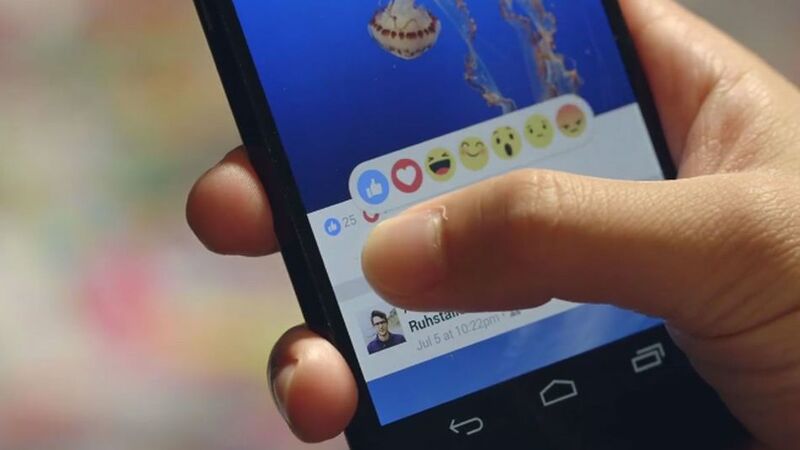 In October 2015 Facebook rolled out its “reactions” to users in Spain and Ireland. In late January 2016, it was announced that users across the globe would be able to use reactions after the success of the early trials. Reactions allow users to do much more than just “like” content. Users will soon also be able to react with anger, sadness, excitement, laughter, and more. This means that users will be able to show a a much broader range of emotions when they’re interacting with your content. But what does this mean for businesses? Currently some 76% of the adult population in the UK owns a smartphone. Of that 76%, between 80% and 90% use emojis. The “face with tears of joy” is the most used, representing 20% of all UK and 17% of all US emoji use. Given the prevalence and apparent staying power of the graphics, they should in theory allow companies to understand people’s interaction with your content. Do particular emojis lead to users doing a different thing? Can they be used to encourage your users to clicking on links, subscribe to mailing lists, or buy products? If they do, then companies will soon be able to develop a much better idea of what content their users like. To begin with, those data sets will be small. But as the functionality rolls out across Facebook’s 1.55 billion users, there will be a wealth of information that will show just what people think of your content and what that means. At the moment people are able to either like or comment on a post in Facebook. Given the clamour for a dislike button, the chances are that these new interactions will be highly used. So instead of simply knowing that something didn’t fly, you could get a much more detailed idea about what people thought about it. As the feature is rolled-out, businesses will be able to track the “reactions” in their analytics dashboards and see how different content fared. For small businesses this could act as a kind of focus group without the associated costs. While they may appear to be a frivolous piece of tech, emojis actually offer companies a much more nuanced view of how people interact with their content. A greater understanding of what people like will allow for a much more targeted strategy, saving precious time and money. The chances are that those companies that get emojis right will probably be crying with laughter all the way to the bank.